We are kicking off our election campaign with a first Week of Action! 15-21 May – Week of Action: Get Britain Registered to Vote! Please join us in daily actions and activities this week to ensure everyone can access their democratic right to vote! Many people do not realise that the deadline to register is 22nd May and this is important as it will disadvantage some groups more than others. Help the push to get everyone registered to vote. Choose the activities you want to do each day. Some of these you can do in 5 or 10 minutes, others you can turn into a bigger project which might have greater impact. This is for you to choose and adapt to fit your circumstances. For greatest impact you might want to consider finding your nearest marginal constituency to take action. Please do share this widely, and let us know how you get on! We’ll be sharing on twitter and Facebook too so hope to see you there and hear about your experiences! Monday 15th: Register to vote! In the last election, more people didn’t vote at all than voted for any party. There are two stages to this: getting registered; and getting voting. Learn about the processes for voting, make sure you are registered to vote and that your details are correct. Find out which parties are contenders in your constituency? Register for a postal vote if you might not make it to the polling station! Share voter registration information with friends, family and people you work with. Share via Facebook, Twitter or other social media. Ask if they have registered to vote. Support everyone to exercise their democratic right. The below are actions you can try within an organisation where you work, volunteer, study or access a service. Support someone within your service or organisation to register to vote. Mobilise colleagues or service providers: Send a message around your organisation asking colleagues to help people to register and vote. Your service may be willing to support an initiative to help service users register to vote if they are not already doing so. You can use our template letter/email on our website (one of our members wrote this and successfully used it within her place of work). The electoral commission also offers resources. Or you might prefer to speak to colleagues/manager to open up this conversation. Feel free to email us to share with us. Young people are significantly less likely to vote than older people. Have a conversation about voting with a young person and help them register to vote (if they’ll be away or in the middle of exams on June 8th, they may need to apply for a postal or proxy vote). You might find this article useful as a starting point for a discussion. If they are interested in being more politically active direct them to this: #TurnUp campaign. Disability If you are based in a service that supports people with any form of disability, offer to spend some time supporting people you work with to register to vote (follow up the actions from Tuesday!). Put a plan in place to support people with access needs to vote on election day. Look up this psychological research that identifies strategies that help people get to the ballot box. Personal is political: Our austerity briefing paper is useful for discussing the relevance of politics to people’s personal experiences. Have a read and share! Thursday 18th: Can you make a difference through collective organising? Find out what other political organising campaigns are out there that reflects your values and interests. Consider signing up to leaflet, canvass or organise for the vote! Put the next PSC/PAA meeting in your diary and come along! Click on Regional groups to find out what is nearest you: http://www.psychchange.org/ If you can’t make a meeting, email us to get more involved! #VoteNHS campaign and road show. PSC is supporting this campaign and some of our members have signed up and joined! If you work within the NHS, you might be interested to join. You can also email us if you’d like an info pack for this campaign! Friday 19th: Take a well-earned rest! Weekend: Getting the vote out! This is the last weekend for people to register to vote, and a chance to put into practice what you’ve begun this week. 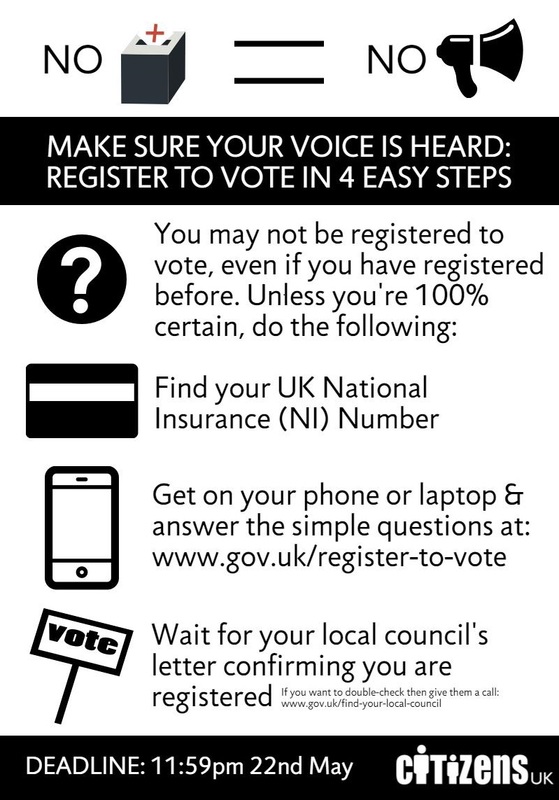 Do you know someone that you could help register to vote? Are there any organisations you could visit to offer to help people register? Consider getting out on the streets with a political party or campaign group that is leafletting or canvassing this weekend. Email us if you would like to suggestions or to find out if other PSC members are doing something near you, or want to find groups to join in encouraging young people to vote. Get ready for our next week of action starting soon! Ten days to go: How you can help to make a difference. Please join us and others across the country by taking part in our second week of actions and activities in the run-up to the General Election. We had some amazing feedback about what people found worked well during our first week of action a fortnight ago, so we’re doing it again! See below for some new daily actions for the final run-up to Election Day. We would love you to get involved however much or little you are able to, and let us know how things go! Choose the activities you want to do each day. Some of these just take 5 or 10 minutes whereas for others (like canvassing) you can give anything from an hour to a few hours. This is for you to choose from and adapt to your circumstances. Get in touch if you aren’t sure or would like some pointers about something. Please share this widely, and let us know how you get on! Which party or groups represent you and your values? Inform yourself and sign up! Talk to people about your and their most important values, policies and voting options! 1. Learn about what policies the political parties committed to? Look up party’s manifestos to see which proposed policies most closely address what is most important to you. Which political party or parties are you most aligned with? Which would you be most concerned about being in power? 2. Get active: Can you make a difference by talking to people at the doorstep or highstreet? Evidence indicates that face-to-face and phone conversations are among the most effective ways to mobilise the vote. Campaign Together is an organising group supporting people who want to canvass with whichever progressive party is most likely to be successful in their local area. You can sign up with any or all of the above to find out more about them before committing to become active with them. Most will provide resources, support and sometimes training if wanted. Look out for training offered by your preferred party or the above organisations. ii.NHS: Inform yourself about the situation and arguments around the privatisation and funding of the NHS. For example, check out the #voteNHS campaign fact sheets and video . And please share this information with people you know on social media! Inequality: look up research on the impact of inequality and related on wellbeing and mental health, such as here. 2. Have a conversation with a friend, colleague or someone you meet in your community about one or more of the above issues that are particularly important to you. 3. Share one or more of the above links with your network on social media or email. 4.Contact us if you would like to be part of the PSC and #voteNHS roadshow. OR check here for NHS roadshow events near you. WEDNESDAY 31st MAY: How can you and your service support people to vote? Plan out your day so that you’ll have enough time to vote, if you’ve not already registered for a postal vote. Can you also be available to help get the vote for a bit of time on Election Day? Can your service remind people about voting and talk through the different parties’ policies with people using the service who would like support with considering who to vote for. Check easy read party manifestos. Can volunteers or workers help accompany people to the polling station on Thursday 8th June? Can you take time off work to help get the vote out? Please contact us via facebook or email if you would like to know more about options for this and what it could involve. THURSDAY 1st JUNE : Sign up and organise to take action! Put time in your diary for an evening or the weekend this final week before election week! See the entry on Monday above for campaigns you might want to sign up with and canvass with. Our members are organising street presence and NHS roadshow events for this final weekend. Please join us to flyer in busy local areas. Or consider offering to host one yourself. FRIDAY 2ND JUNE: Take a well-earned rest! Or get your canvassing time in this evening or plan to give some time this weekend – the last weekend before the election! Canvassing and #Vote NHS Roadshow events! Join a group near you to take to the street! Saturday 3rd June: Join us in Brentford and Isleworth! PSC will be joining forces with NHS Roadshow to bring our message to the streets! We’ll be on Chiswick High Road between 11.00 and 13.00 and then heading to Hounslow High Street 14.00 till 16.00. Every one is welcome for as little or as much time as you can spare. We will be leafleting and chatting to the locals about, NHS, funding, mental health, party policies… and lots more! If you’re interested please email PSC for further details. If you would like to be part of an #voteNHS event in a marginal constituency near you, get in touch to find out what’s going on or get our support in organising one! How did you get on? Anything useful? Let us know! Had a conversation with a friend of colleague about issues that matter to you Canvassed with a local party Used the PSC briefing papers to help inform your discussions Talked to service users about voting Helped someone to vote Not as much as I would have liked All too overwhelming!